In 2015, longtime fans of Digimon (“Digital Monsters”) rejoiced with the 15th anniversary of Akiyoshi Hongo’s franchise with the start of Digimon Adventure Tri; a six-part series that serves as direct sequel to the first two television series, Digimon Adventure and Digimon Adventure 02. Basically, after the first two seasons of the show. Taking place three after the events of Digimon Adventure 02, the first film titled Digimon Adventure Tri. Chapter 1: Reunion (or simply just “Reunion”), which was released in Japan on November 21st, 2015 and showed up in North America the following year on September 15th, 2016, saw the return original eight “DigiDestined” team (and their respective Digimon partners) as a mysterious anomaly is causing distortion rips between the “Real World” and the “Digital World”, with several Digimon being plagued by a virus that turns them hostile. While the film did have some problems, Reunion was a great way to rekindle fans of the original two Digimon seasons by introducing / continuing the adventures of the show’s original character (and their Digimon); landing the groundwork for an interesting new chapter in this anime series. Now, continuing the adventures of Digimon Adventure Tri, comes the second installment of this six-part anime series with Digimon Adventure Tri. Chapter 2: Determination. Is this next Digimon adventure feature worth seeing or does it fail to ignite that reminiscent to the original “DigiDestined” team? After battling against Alphamon at the end of Reunion, Determination picks up sometime later, finding the DigiDestined team trying to return to a sense of normalcy; balancing their normal everyday school life with their Digimon as well as trying to still uncover the mysteries behind the distortions and the infected Digimon that are coming through. While the secret government agency that employs Maki Himekawa (Cherami Leigh) and Daigo Nishijima (Doug Erholtz) seems to be have better grasp of when the distortions are going to appear next, the DigiDestined kids have more time relax (although Leigh and Nishijima still keep a watchful eye on them). Additionally, Meiko Mochizuki (Cristina Vee) and her partner Digimon Meicoomon (Kate Higgins) are welcomed into the group as the new members of the DigiDestined team. 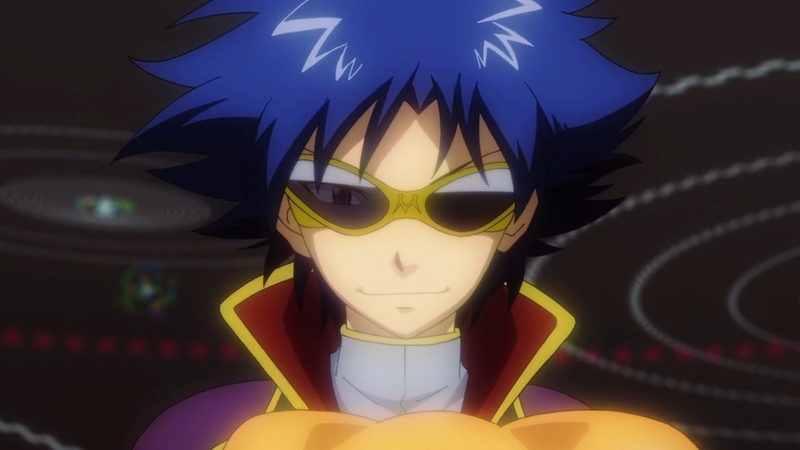 However, as new infected Digimon continue to appear, including an infected Ogremon, the situation begins to change as the friendship bonds between several DigiDestined characters (and their partner Digimon) will be tested as well as confronting new revelations, including the shadowy reappearance of Ken Ichijouji as the Digital Emperor. Being a fan of Digimon, especially Digimon Adventure 01 and 02, I was gleefully excited to learn about how Digimon Adventure Tri. Like I said in my review for Reunion (click HERE), I was somewhat surprised and not really expecting to see the first entry in the spin-off / sequel series, so I was very much glad that I was able to see it, especially at my local movie theater. As for the movie itself, it was pretty good. Yes, there were some nitpicks I said about it, but my overall impression of Reunion was generally good, finding it a great way to expand on the original characters from Digimon Adventure 01 with a whole new adventure (kind of a bit of childhood nostalgia for me). Thus, I was looking forward to seeing Chapter 2: Determination when it got released on in English Dub. I knew that the movie was already out in Japan, so I stayed away from YouTube and other internet sites that might have spoil what was in store for Determination. However, there was no special theatrical release for Determination (at least in the US), so I had to wait almost 11 months for when Digimon Adventure Tri. Chapter 2: Determination was released on Blu-Ray. What did I think of it? Well, while I see found this series to be enjoyable, Determination was a step backwards in comparison to Reunion. It still fun to catch up with the DigiDestined gang (and their Digimon), but Determination just feels like a “filler” entry in this six-part feature film series. Like before (and I think it’s going to be for the entire film series), Determination is directed by Keitaro Motonaga, who previous such anime series such as Quiz Magic Academy and Yumeria. Much like Reunion, Montonaga still continues to do a good job in reestablishing the original DigiDestined kids, who are now in the High school and dealing with more “teenage” issues as well still continuing this new “infected” Digimon threat. 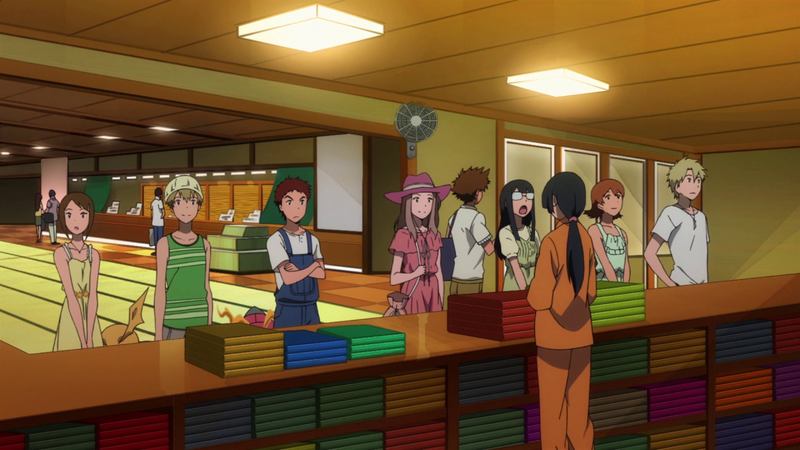 Of course, the movie gives each of the DigiDestined their moment in the spotlight, but Determination gives several big and important moments to both the characters of Joe and Mimi. This decision is really interesting as both e and Mimi never really get their “moment” during the course of the show. Tai and Matt are always prominent characters (being the leaders of the team), Izzy is always the talented intellect, and even T.K. and Kari were important players in the television series. First, Mimi has always been the out-spoken and self-centered one of the group and its neat that she kind of realized it and brought into the foreground. As for Joe, his narrative arc in Determination is probably the most compelling and intriguing. Basically, Joe is too busy studying and getting ready for school to hang out with the rest of his DigiDestined friends. This reflects upon his outlook of life, looking to the future as an adult (beyond Digimon and being a DigiDestined). Of course, the Digimon characters themselves are a delight to see once again, especially when they mostly in there cute “rookie” level. However, one of the greatest things that happens in Determination is to see Gomamon and Palmon (that’s Joe and Mimi’s Digimon) reach the mega level digievolution of Vikemon and Rosemon. This is big as only Agumon (as WarGreymon) and Gabumon (as MetalGarurumon) were the only two Digimon to the DigiDestined that were able to reach the mega evolution. So, it was cool to see this as I predict that all the rest of the Digimon to the DigiDestined team will eventually reach the mega level in the coming entries. Lastly, I found it cool that Determination still uses the song “brave heart～tri.Version” by Ayumi Miyazaki that was first appeared in Reunion. Love that song! While Reunion did have its fair share of problems (but ultimately proved to be a welcomed introduction for Digimon Adventure Tri. ), Determination falls below it predecessor in several areas. For starters (and this looks like it’s going to be a reoccurring trend throughout the entire series), the animation is still a somewhat of a mixed bag. The overall animation looks okay, but there are still plenty of moments (i.e. faraway shots and a few close-up shots) that either look shoddy or bad (much like what Digimon: The Movie looked like if you catch my meaning). Of course, the Digimon look better, especially when they Digi-evolve and / or partaking in battle, but since Determination doesn’t have much of battles / action, it’s quite noticeable for most of the feature. I do hope the animation-style does get better with the next installments. Another problem with this movie is the lack of action. While Reunion had the task of reintroduction us to the original eight DigiDestined characters and their Digimon, the movie still had enough time to feature roughly three cool battles throughout its runtime. Determination, however, only really has two or rather one and half. To be truthful, most of Determination’s runtime is delegated to either character building (i.e. Joe, Mimi, and Meiko) or a bit of comical relief (especially with the Digimon). That means that the movie doesn’t have a lot of time for action or battles. Sure, the battle with Imperialdramon is kind of cool with Gomamon digievolving into Vikemon and Palmon digievolving into Rosemon, but that’s towards the end as we (the viewers) have to wait just and sit through some pretty boring stuff like when the DigiDestined team goes to a Hot Spring to relax. It’s a fun scene, but it becomes boring to watch. Thus, those expecting to see a lot of Digimon battles in Determination are going to be disappointed. In addition, the movie does little to advance the overall narrative arc of Digimon Adventure Tri. (i.e. the distortions and the infected Digimon that are coming through). There’s a couple of new insights here and there, but Determination merely presents more questions rather answering several already established ones. This is the coincides with the appearance of Ken Ichijouji (a protagonist / antagonist character in Digimon Adventure 02) who seems to have slip back into his evil Digimon Emperor appearance / persona. However, is it really Ken? Or is it someone else pretending to be him? Unfortunately, you really don’t know as Determination doesn’t give much to time to explain his appearance (he doesn’t even speak in the movie). I’m sure the sudden appearance of Ken will be explained in the upcoming installments, but it just seems a bit out of place. I mean…. wasn’t Ken redeemed at the halfway through Digimon Adventure 02? Speaking of Ken and of Digimon Adventure 02, where is the rest of DigiDestined team from Digimon Adventure 02 (i.e. Davis, Cody, and Yolei)? Where are they? This further adds to the confusion when Imperialdramon appears, which was mega level evolution to Davis’s partner Digimon Veemon. Where’s Davis? It doesn’t make sense! Again, I hope the answer comes out in the future Digimon Adventure Tri. chapters. Echoing to what I said in my review for Reunion, Determination continues the trend of using some of the original English Dub voice actors from TV series. So, Digimon veteran voice actors like Joshua Seth as Tai Kamiya, Colleen Villard as Sora Takenouchi, Mona Marshall as Izzy Izumi, and Philece Sampler as Mimi Tachikawa. Even some of the voice actors for the Digimon come back, including Tom Fahn as Agumon, Kirk Thornton as Gabumon, Jeff Nimoy as Tentomon, and Robert Martin Klein as Gomamon are a welcomed sight (or rather sound) for sore eyes (or rather sore ears); bringing a sense of familiarity and maybe a bit of Digi-nostalgia within their performances. The other non-Digimon veteran voiceover work, including Robbie Daymond as Joe Kiddo, Vic Mignogna as Matt Ishida, Tara Sands as Kari Kamiya, and Johnny Yong Bosch (still can’t believe that’s Adam Park from the Power Rangers TV Series. So Cool!) as T.K. Takaishi, are good in their roles, but I still think it would’ve been cool to hear their original voices once again as the “new” voices don’t quite compare to the ones I’m use to watching from the first two Digimon seasons. 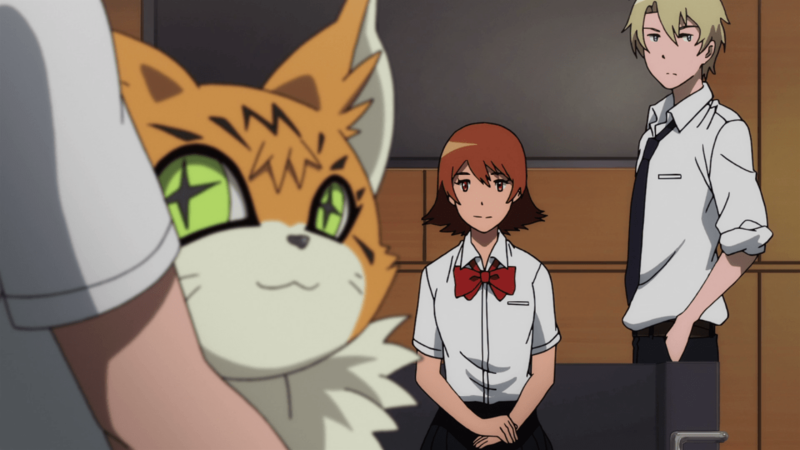 The DigiDestined continue look for answer about the mysterious distortions of late and about the infected Digimon in the new movie Digimon Adventure Tri. Chapter 2: Determination. Director Keitaro Motonaga’s second installment in this six-part series continues to expand the narrative of the original set of DigiDestined characters (and their Digimon) as well as introducing the newest team members (Meiko and Meicoomon), and interesting ending twist. Unfortunately, with the lack of action scenes, a lot of filler time that doesn’t advance the plot, and the drop of animation quality, Determination can’t overcome or what Reunion was able to achieve. Personally, I felt it was somewhere between good and okay. It was interesting to see Joe and Mimi get their moment in the spotlight (and to see Digimon reach “mega” level evolution), but it was a bit lackluster as I prefer to re-watch Reunion over Determination as it just seems more better rounded by comparison. Still, if you’re fan of Digimon (both the original TV show and of Digimon Adventure Tri. ), Determination, despite its flaws, is still adequate feature film to watch. That means that I would give this movie a passable recommendation as well as an iffy-choice. With Chapter 3 (Confession) is already out in Japan as well as Chapter 4 (Loss), it will be still interesting to see where this new anime feature film series will go from here. Hopefully, Confession is better than Determination. Digimon Adventure Tri. Chapter 2: Determination is 88 minutes long and is not rated (at this moment) by the MPAA. However, I would say it s PG for cartoon action violence.